| The Attic Shoppe Trading Co. Welcome to The Attic Shoppe Trading Company! We are a small, artist run shoppe that offers original tarot decks, artwork, books, OOAK items, and so much more. Please use our navigation bar below to view our different decks, prints and various other unique items. Below our navigation bar are quick links to currently available items, sales and new additions to our shoppe. Thank you for visiting and we hope you see something you like! Please follow us on INSTAGRAM, FACEBOOK, and TWITTER. Our shoppe needs some social media love! 04-01-2019: Happy April Fool’s Day! I’m officially retiring all my decks and never selling even one of them again! It’s been real folks! K, that was all I got. But seriously, welcome to what finally feels like the real start of spring. I don’t have a lot of updates for the Attic Shoppe. I just got back home from my first convention of the season. It went smashingly. I got to see a lot of old friends, made a few new ones, and talked a lot of people into trying out tarot for the first time. Before I left I got nearly all my special day sales into the post and off to their new homes. 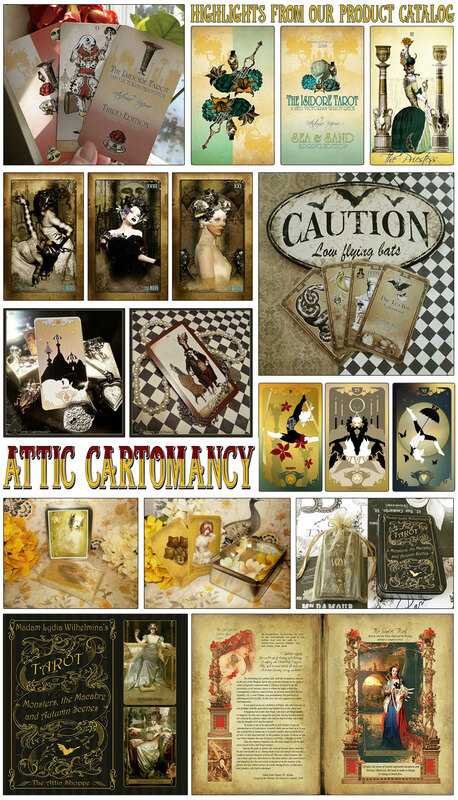 I’m down to the last ten backers on my IGG campaign for Attic Cartomancy – and I picked up some fun things at the convention to include in those limited editions and gift boxes. Today I will be taking inventory of what I have left after the convention so that I can start putting stuff up for sale again. That is about all for now. Life is starting to thankfully get back on track. Although I have to admit my life always seems just slightly off the rails at all times. Perhaps I need to adopt some wheels for all terrain!